Long before the bright lights and endless rows of slot machines and gaming tables, Precision Environmental crews were hard at work paving the way for the casino project undertaking. In November of 2010, efforts began to transform the historic Higbee Building in Cleveland into Ohio’s first casino. The 1st contractor on the scene, Precision performed $5 million worth of remediation, demolition, concrete, flooring, electric work and several other services throughout the 350,000 square foot ornate building. Throughout the challenging eighteen month renovation project, Precision crews ranged from twenty to upwards of fifty laborers, carpenters and finishers – spread over multiple shifts across the crowded work site to accomplish a variety of tasks. Precision’s initial work included asbestos abatement & mechanical systems demolition in the mechanical spaces. The areas were extremely congested with over 300 tons of mechanical systems to be disposed of and recycled. Next, selective demolition including 7,500 cubic yards of construction debris, 250 tons of metals, nine escalators and an entire elevator system were removed from the iconic building. Due to existing tenants below, the 72,000 square foot 3rd floor needed to be abated and demolished at night during a strict two-week time frame. In order to do so, Precision utilized drop holes cut through the floors that allowed crews to load approximately 350 cubic yards of waste per shift. In order to accommodate new raised slab areas encompassing the entire gaming area, Precision crews had to remove over 20,000 square feet of 5 ½” topping slab without damaging the 8” terracotta underneath. 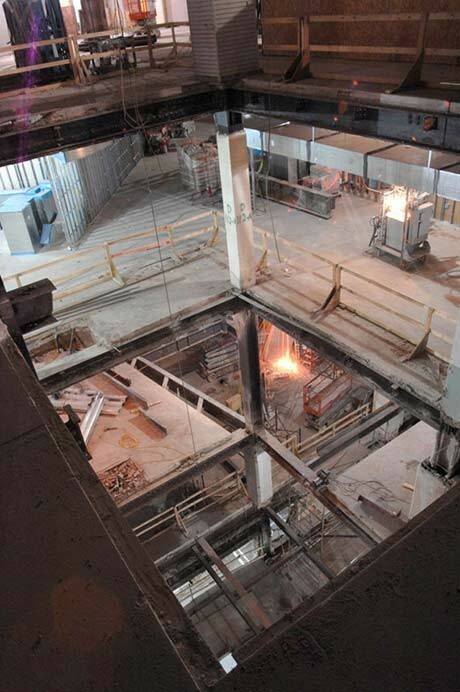 Upon successful completion of the task, crews then installed 5” of high density foam board and 3 ½” of light weight concrete topping slab in order to raise the floor to meet the elevation of the computer flooring that runs throughout the entire 96,000 square foot gaming area. The entire process was completed with sub surfaces intact and undamaged. One of the most intricate aspects of the Casino project included the demolition of the sub-basement mechanical system. Precision crews built protection over the 150 lineal feet of fiber optic cables belonging to the technology company. It was estimated that damage to the cables would cost the technology company in excess of $1 million per day. A casino pioneer in the state of Ohio, the Horseshoe Casino Cleveland was a project undertaking like none other. While most environmental companies may play an active role in the early stages of the construction process, Precision’s presence was felt from day one of construction through the grand opening. Once demolition was completed, Precision continued to be involved in the project using expertise to assist other trade contractors onsite. Work included concrete in filling former floor openings and structural demolition of full depth floor slab penetrations & associated concrete work to accommodate the new escalators, elevators & stairwells. In addition to the detailed projects listed above, Precision was relied upon to handle the patching of the terracotta ceilings, the ardex leveling of various concrete surfaces, the installation of the pedestrian floor mats at the entranceways as well as all of the mechanical duct penetrations and core drilling for the piping. From start to finish, crews were able to showcase the experience, professionalism and wide assortment of services that Precision Environmental provides to customers across the region and beyond. All of the work at the casino completed by Precision required extreme sensitivity to maintain the historic integrity of the original facility. The unique array of furnishes services allowed for a more streamlined construction schedule. The entire scope of work for Precision Environmental and Precision ProCut was completed safely, on budget and ahead of schedule. The Horseshoe Casino Cleveland, Ohio’s first casino, opened its doors to the public on May 14th, 2012. In the fall of 2012, Precision Environmental was named a finalist for Associated General Contractors Build Ohio Award. Voted on by a panel of highly regarded retired construction professionals, The Build Ohio Award recognizes commercial contractors for excellence in construction. Precision Environmental is honored to have been selected as a finalist for the award, our 2nd year in a row having been selected within the Specialty Services Category (Global Center for Health Innovation – 2011). Asbestos abatement and selective demolition of the iconic 81 year old Higbee Building into a four story, 350,000 square foot full-service casino.